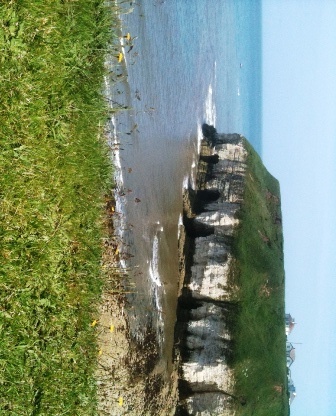 We visited Thornwick Bay in Yorkshire last week on a balmy sunny day when the wind was merely a whisper. 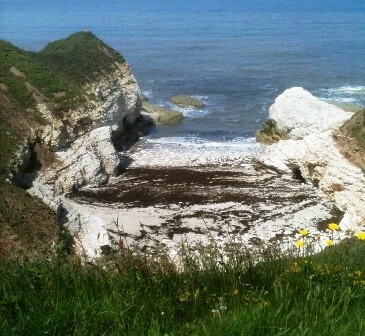 The views were dynamic as the sea crashed against the chalk cliffs to produce spectacular sprays. Small flocks of gannets cruised across the sky and sand martins skimmed over the pebbles. View of small cove from outside the cafe. It’s a place that could easily be bypassed as you need to turn left before you reach North Landing. The car park cost only a £1 and was sparsely furnished with cars. While some visitors sat by their cars on the grass, picnicking, others perched near the edge of the cliffs enjoying the sea and caves. A few had binoculars and were studying the sky. There is a cafe, which sells hot drinks, cakes, ice cream and lunches and dogs are allowed inside the cafe. Although we picnicked on the grass we enjoyed a cup of tea in the cafe later.To the right of the cafe (facing the sea) is a large bay with caves; to the left a small bay. We decided to descend down the bank to the small bay. I don’t know how many steps there were but they were steep and a number were missing. It was definitely worth the effort as the beach was deserted and I explored what I thought was a cave but which turned out to be an archway through to the sea. The smell of the sea was refreshing and the pebbles were covered with seaweed. The only downside was the number of plastic bottles dumped there. I would have picked them up but I knew I’d need both hands to climb back. View of the smaller cove from the beach. The climb up to the top was less fun as there was no handrail and where there were missing steps it was, shall we say, interesting. I was relieved when we reached the cafe again but wouldn’t have missed that special time in the little cove. 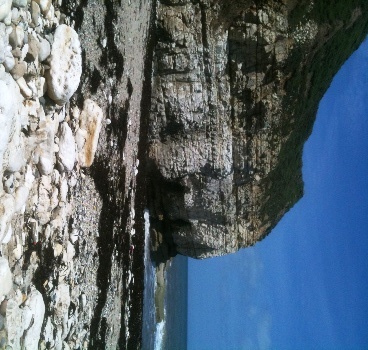 The larger bay at Thornwick showing the caves.